Today, we are solving the riddle made of the Hamberder tweet and the 3 other tweets of the day. Before we proceed, I would like to announce that my good friend White Squall has recently started posting on Twatter link. Those who are familiar with my comment section already know him through his exquisite contributions. If you are serious about Q and want to go deeper in knowing Q comms, you definitely want to add White Squall’s insights and way of thinking to your arsenal. Have fun! As you already know, in his first Jan 15 2019 tweet, the Maestro epically introduced us to ‘Hamberders’ at 7:58AM, left the tweet visible long enough for the world to see, the decoders to pick it up and his detractors to mock him, deleted it and corrected it at 11:11AM. In between, he gave us 2 other tweets. You know the drill, let’s solve. Let’s have time somewhere in the back of our head… Img2PNG We find a first TIME article where we learn Americans celebrate the Fourth of July with fireworks and eating hot dogs. The related sentence links to a second TIME article about how hot dog may have gotten its name which in turn links to a third TIME article with a graphic showing how many hot dogs it takes to win the Nathan’s Eating Contest. Img3PNG We also learn this contest is held on Coney Island in New York City. Peruvian coffee for those who noticed the Maestro said ‘I fired James Coney’ in his Jan 12 interview with Judge Pirro! . By doing so, the Maestro pulled Comey into the riddle and confirmed the 3 TIME articles we found are indeed the relevant ones. What is the Maestro establishing here? Why does he bring in a hot dog eating contest and specify ‘he paid’ and that ‘within an hour, it was gone’ and that his guests are ‘great guys and big eaters’? Yes, he is referring to the Wikileaks emails where we learn Hussein spent 65k USD of Taxpayer money on hot dogs and pizzas flown from Chicago! link. The Maestro is giving us real world stats on Joey Chestnut’s performance we may use as a benchmark to analyze Hussein’s party and determine if we were really talking about hot dogs or pizza the way you and I understand it. Let’s make very rough and conservative estimations. For the sake of argument, let’s suppose the dogs/pizzas were actually flown from Chicago with a private jet and that the transportation bill was 25k USD. Stop here. Laugh very hard. Continue. 40k USD remains for the food. Let’s suppose they spent 20K for pizzas and 20k for hot dogs. For less than 20 bucks, you generally get a family size pizza with all sorts of toppings link, for 2, you have more than enough for a hot dog. So? The party had at least 1,000 pizzas and 10,000 hot dogs. Since Chestnut’s record high is 74, this means Hussein budgeted for 135 world class champions Chestnuts to down his hot dogs and 500 other people who can each eat 2 family size generously topped pizzas! Question: should we move the Nathan’s Eating Championship from Comey’s Island to the White House?! You got it. We are in Pzgt territory. Confirmed by the capital letters of the tweet: G NC CT WH B S I FF I W G=159, same value as VATICAN SECRETS. First piece of the puzzle: pedophilia. Q informs us this tweet was put there for a security test. Which one? Yes, to determine in our case if the key is PC or JW. Img5PNG The capital letters of the tweet add up to WNP=53, same value as SUM. So? We sum up the numbers of the timestamp 8:25, we find 8+25=33. Since PC=16+3=19, this key failed the security test but JW=10+23=33 passed it. Through this test, we have found the key and it’s JW. Confirmation needed? Peruvian coffee for those who saw that JW is the acronym for ‘Just Wondering’, link1 - link2, which is exactly what the Maestro is doing in this tweet about Nancy Pelosi. Pretty cool right? Q1023 Would you invade a country whereby a good portion of its citizens are armed? The ‘ultimate deterrent’. 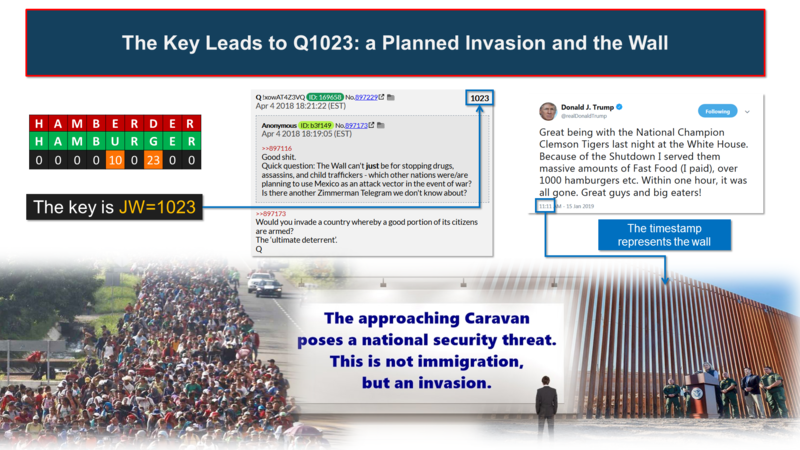 You now really understand why there is so much resistance… This has never really been about Immigration, it has always been about National Security. Second piece of our puzzle: the Wall. Let’s now take a closer look at the third tweet of the day. Timestamps= 10:18. Let’s go to Q1018. Who do we find? John Brennan! In this post, Q provides links and we learn Brennan created The Analysis Corporation TAC in 1990 and, if we add the open source information about Brennan found here, we can summarize things this way: as Brennan was CEO of TAC, a TAC contractor gained illegal access to Hussein’s and No Name passport information on March 14 2008 link. After this incident, Brennan joined Hussein’s campaign team as an adviser on Oct 2008. Wait. Isn’t this strange? Hussein should be pretty concerned about people illegally getting access to his personal information right? Yes, from this article, we learn he urged inquiry into passport snooping but 6 months later, the very guy ultimately responsible for this snooping joined his campaign team! Then, when Hussein got elected, Brennan’s career spectacularly jumped from an obscure C_A agent who culminated as Interim Director of National Counterterrorism Center in 2004 and who had to go back to the private sector in 2005 to Homeland Security Adviser in 2009 and C_A Director in 2013! And of course, in parallel, TAC’s government services also jumped from a conservative maximum average of 40M/year between 2000 and 2008 to 150M in 2009! Do you see it? What life changing data did Brennan gather after he accessed Hussein’s and No Name’s passport information? Will we ever know? Q says yes. I will show you where and how.